- music starts automatically when Bluetooth headphones connected. As is configured. - pressing play/pause button on headphones, player pause the music and disappear from the notifications. How should be and how is working on the previous builds. 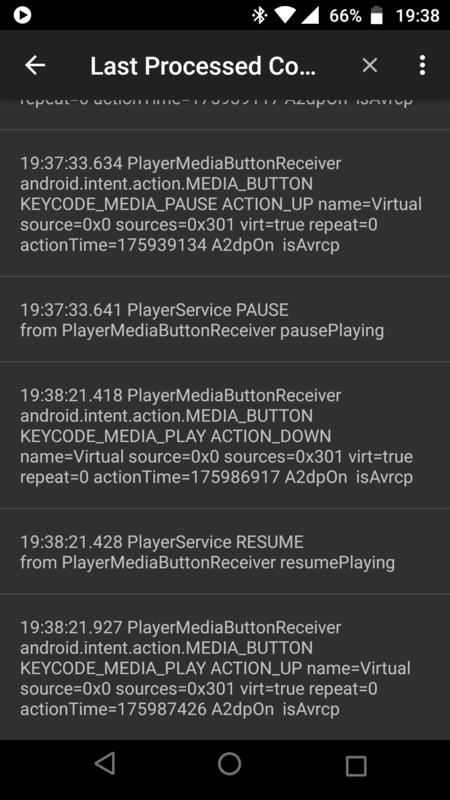 - pressing play/pause button again, player is not starting the music and not showing up in the notification. Build 814 and older work fine, music starts and player shows up in the notifications. Under "Last Processed Commands" player is showing two messages for each single press of the headphones button (btw, I'm not finding the same option in the older builds). That's looking wrong. Please check screenshot. I'm guessing, bug is in new feature called "better head units media command processing" introduced in 815 build. Setup I'm using is Moto Z Play, running Android 8.0 and Sony MDR-ZX770BN. 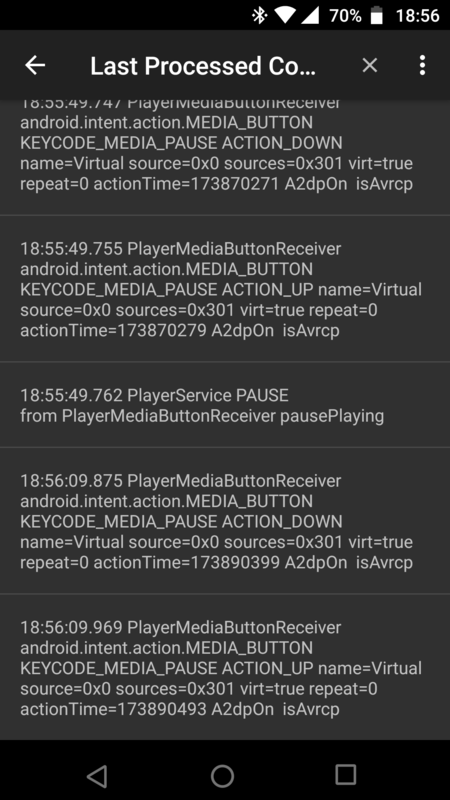 Interesting, play/pause function works fine with my another headphones, Sennheiser PXC 550, the same phone and the latest build 816. Strange, after turning off Sennheiser and turning Sony on, play/pause works fine with MDR-ZX770BN as well?! Only what I did is to test with Sennheiser, turned Sennheiser off, turned Sony back on and now is working. But, as soon I turned BT on the phone off, then on, Sony gets connected and bug is back. 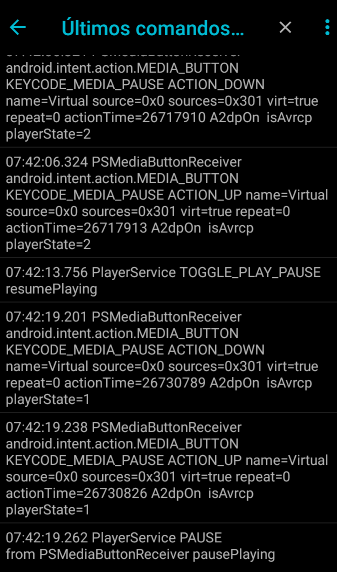 Sony can pause the music but not start playing again. When is working, there is three messages for each button press. Please check the second screenshot. It's taken when Sennheiser was connected. If I can provide more data, bug report or similar, just let me know. I'm seeing the same behaviour (Nexus 6P & Aukey EP-B26 Headset). Thx for confirm this bug. So far, nobody cares. I've reverted back to 814. I am experiencing the same issue with similar results as those shown in your screenshots with multiple responses registered for each button push. Issue: pressing play/pause button while music is playing causes music to pause as expected. 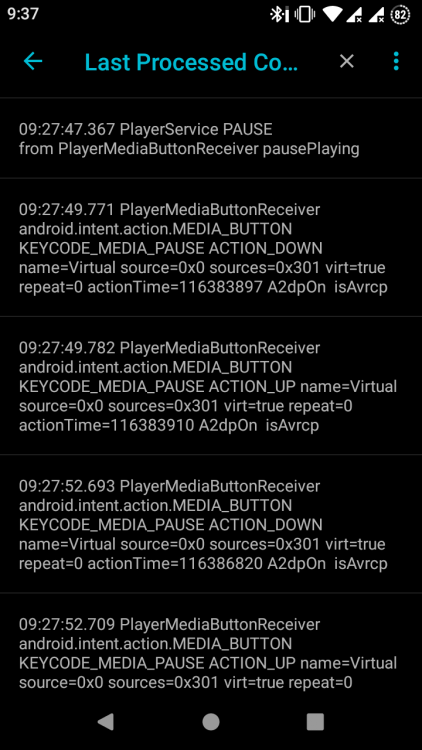 Pressing pause/play button again causes beep, music to play briefly then pause. Pressing pause/play button again causes music to play briefly without beep then pause. Repeatedly pressing play pause as above will eventually play music. I don’t see anything wrong in screenshots, but the log is very incomplete (you can send/copy the log via overflow menu on that screen). That also can’t be reproduced with my devices, but those are always properly paired and I don’t have any other 3rd party apps which interact with bt buttons or generate those. Try to change BT buttons processing to double clicks or long clicks and check if it helps. Observing the last processed commands I see that when I double click button in the bluetooth headphone, apparently no command is received. But I noticed that a couple of times the skip worked and I think to know what is the problem: the Poweramp timing measurement of the double click is too fast for this headphone model, that probably is a little "slow" to send commands to the phone. 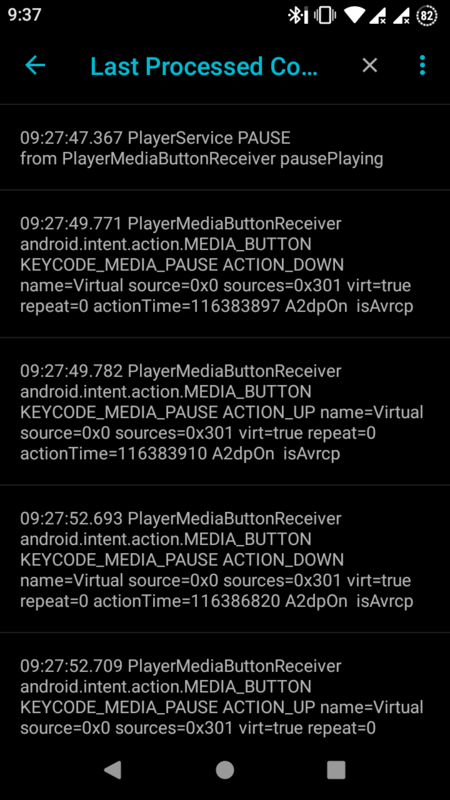 Poweramp V3 does not start with BT connection with Renault RLink. Going back to Poweramp-2.0.10-build-588-uni solve the problem. I still have the same problem, I tried on a Moto X Play and it works correctly the same version, I have a Moto G3 and don't works.